Edgar Rice Burroughs’ most popular character, the “Ape Man” known as Tarzan, has been brought to life so many times over the years by actors who each put their own stamp on the classic character, including Johnny Weissmuller, Gordon Scott, Christopher Lambert and Tony Goldwyn. Now, it’s Alexander Skarsgård’s turn to become the Ape Man, raised by gorillas in the African jungle and swinging on vines while wailing a battle cry that sounds like a tenor in a sophisticated opera being sodomised. Which begs the question: how on Earth did Skarsgård make him the least interesting thing in his own movie? 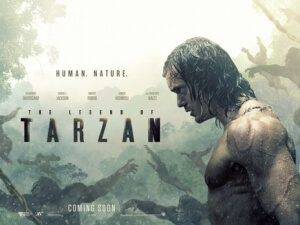 The Legend of Tarzan, in which David Yates directs Skarsgård as Tarzan – now civilised and living in London with his wife Jane (Margot Robbie) – returning to Africa due to some complex political jargon involving the King of Belgium and ending up having to rescue her from a dastardly diamond-hungry Belgian named Léon Rom (Christoph Waltz, basically playing Belloq from Raiders of the Lost Ark), manages to make a semi-decent case for a Tarzan movie where Tarzan himself is entirely dispensable. Skarsgård is given no more than twenty pages of dialogue, most of which is probably grunting, and no definable character to make him interesting or easy to root for; instead, he’s just the stock character for every action or adventure movie ever made, with the incredibly impressive but somewhat out-of-place ripped body off an 80s-era Stallone or Schwarzenegger. The Swedish actor, who has proven in the past to be a pretty charismatic performer, simply has nothing to work with here, and his flat and even lifeless performance as the classic character greatly reflects that here; it really says something when the Disney animated version, voiced by Goldwyn, has way more personality and charm, and he was just a series of drawings. Skarsgård’s Tarzan is undoubtedly the least interesting part of his own movie, and it honestly wasn’t even that captivating of a movie to begin with. It definitely has ideas, namely what it would be like for the character to actually return to the place he spent most of his life after a period of civilisation in England, but the script doesn’t explore them enough to make them more than just ideas, and it settles into a generic “man must save woman from villain” plot we’ve seen over and over. It’s very predictable and doesn’t take many chances to make itself stand out, not helped by a sluggish pace that fails to get the ball rolling quicker than it should. Yates, too, has never wowed us as a filmmaker – his awkward framing and somewhat stiff direction, the weakest parts of all the Harry Potter films he’s made, are back in full force here to help him paint on a forgettable canvas of bland material that, try as he might, never fully gets off the ground, though the cinematography can look very nice at times when it’s not being overcast and ugly. According to the press notes for this film, they proudly state that “no animals were used in this film”, presumably to avoid a right telling off from the American Humane Association; but when EVERY. SINGLE. ANIMAL in this film is head-to-paw CGI, and not even good CGI especially compared to the majesty and awe of what was in The Jungle Book not that long ago, it looks more cartoonish than even Disney’s Tarzan. It’s mind-boggling how much this film favours CGI over practical effects, which in fairness would be very hard to pull off but regardless there needs to be a balance that doesn’t allow that element to fully dominate. Every backdrop and action scene is also guilty of this, with none of it managing to convince because it all looks so fake; we are so used to the illusion by this point that we can identify it right away as an effect and not as an actual thing that’s there, and there are many times during watching this film where we were convinced that they just handed over the film to the effects department and paid them to make it fully animated instead of a proper live-action film. Thank goodness for Samuel L. Jackson, who’s at least having fun as George Washington Williams, the real-life African-American authority figure who’s essentially Tarzan’s comedic sidekick but isn’t entirely played for laughs; he’s given a good amount of weight as a character, and you’re completely on-board with his backstory and personality. You constantly want to see a film about this guy and not the guy he’s meant to be a supporting character to, which is ultimately where The Legend of Tarzan utterly fails: not only is Tarzan the least interesting part of his own movie, but there’s nothing about him depicted in this movie that even warrants a “legend” to begin with. Here, he’s just another throwaway action hero, and in this day and age what’s so legendary about that? Save yourself some time and money by just putting on the Disney version instead; at least that one has personality. The Legend of Tarzan is a dull reinterpretation of Edgar Rice Burrough’s classic hero that somehow makes the title character even less interesting than the generic plot or overuse of unconvincing CGI surrounding it all.